Oppo has just announced the “latest tech at an incredible price” will arrive on Flipkart. The company is gearing to launch a midranger with an under-display fingerprint scanner in India, and it is in all likeliness the the R17 Neo. There's an outside chance that the Oppo K1 or Oppo R15x might step out of China, but the Neo is already available internationally so it's the prime suspect. The teaser does not say much, but given the R17 and R17 Pro are already for sale in India, the R17 Neo is most likely to join them. It shares some features with its bigger brothers like an AMOLED panel with an under-display fingerprint scanner, but is way more affordable. 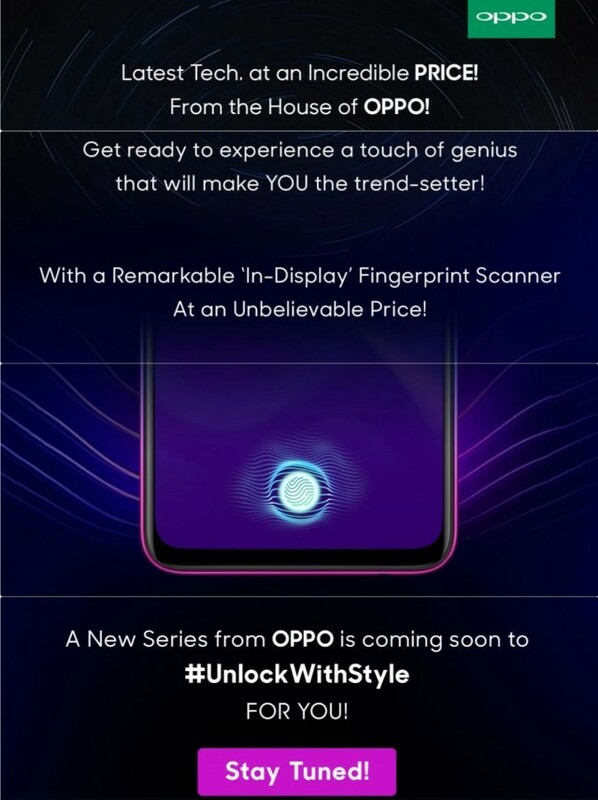 Earlier rumors also suggested Oppo F11 and F11 Pro are on their way to be introduced in India. They can either be the Oppo K1 and Oppo R15x with a new name for the global scene or can be entirely new devices that will upgrade to AMOLED panel that is crucial for the UD sensor to work, instead of the LCD in the Oppo F9 Pro.